“A huge success that has more than met our expectations.” These were the words of Lynsey Lawson who is the team leader for family and bereavement support at the Furness based St Mary’s Hospice when she was asked for her views on the recently commenced ‘Make Do and Mend’ initiative based at the hospice’s retail premises in Duke Street, Barrow-in-Furness. 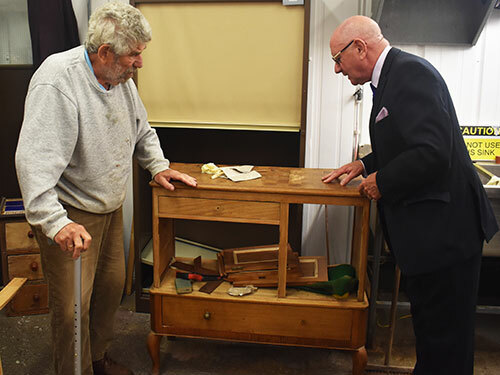 George Last (left) discusses the restoration work that he has carried out with David Grainger. The scheme was able to be implemented due to a grant of £20,000 from the Masonic Charitable Foundation. The donation from the MCF enabled an unused corner of the premises to be developed into a suitable work space. 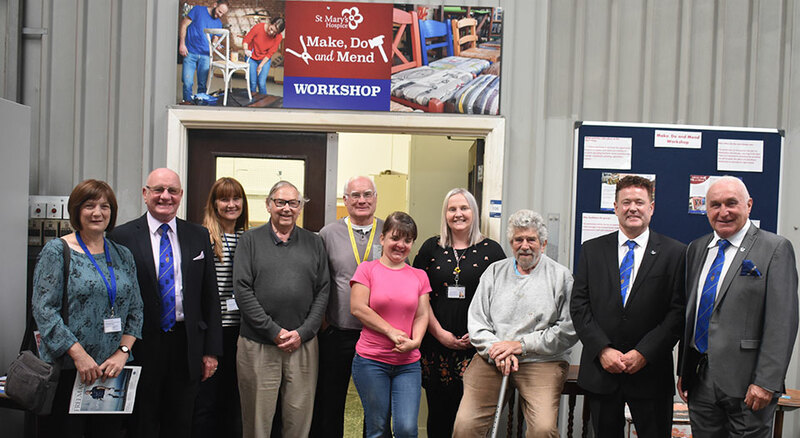 An invitation to visit the workshop and meet some of the users was readily accepted by West Lancashire Assistant Provincial Grand Master David Grainger along with Furness and South Lakeland Group Chairman Peter Schofield and local charity steward Richard Wilcock. Olivia Armistead (left) describes to Lynsey Lawson and Peter Schofield how the scheme has helped her. It is not only men who benefit. Olivia Armistead found it difficult to cope with the loss of all four of her grandparents in a short space of time. 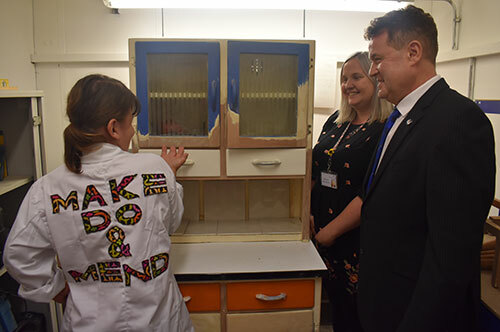 Olivia attends the workshop and took pride in showing Peter Schofield the kitchen cabinet she was working on as she told him how much the scheme had helped her. You never know but with various television programmes making ‘shabby chic’ furniture a fashionable addition to the modern home then the ‘Make Do and Mend’ label may be a collectable of the future. Pictured from left to right, are: Jo Blake, David Grainger, Caroline Welch, Charles Floodgate, volunteer bereavement counsellor Paul Elliston, Olivia Armistead, Lynsey Lawson, George Last, Peter Schofield and Richard Wilcock.